This 14 day adventure takes its innocent beginning in Nuuk the Capital of Greenland and our home. It has been a long standing wish to go to the northernmost part of Greenland and to go see the unique part of the Greenlandic environment and culture rooted there. ﻿ A 14 day arctic spring adventure, with destinations such as Qaanaaq, Whalrus hunters at the edge of the sea ice and Siorapaluk – the northernmost natural settlement in the world. 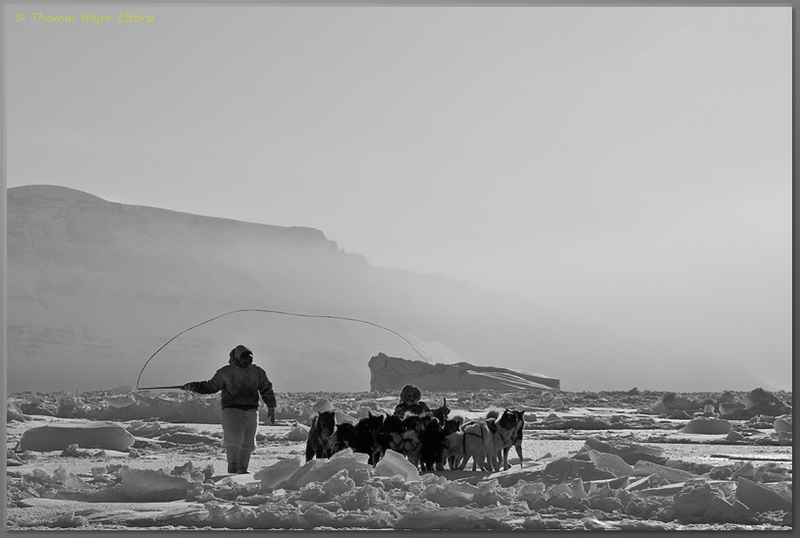 The way home would very conveniently take us via Ilulissat, one of my favourite destinations in Greenland both summer and winter - A perfect opportunity for additional dogsledding action and an opportunity to visit friends. I sincerely hope you will enjoy this log, the images going along with it and perhaps most of all, the introduction (or reintroduction) to Greenland as a winter travel destination. Really like this photo. captured very well. The whip is perfect composure! First class photo! Finally back in town again. I greatly appreciate your kind compliments on the image, it is on of my favourites from this journey of ours.